Jay Goradia, a 25-year-old engineer, walked into a hypermarket in suburban Mumbai looking for shampoo and some other personal care products. A little while later, he walked out with an expensive cellphone, along with the shampoo. “The disadvantage of malls is that you end up buying more than you intended to. Things are displayed in such a way in a mall that you tend to get tempted," he says with a grin. Goradia says he loves hanging out at the new branded retail outlets which are changing the landscape around his home in Mumbai’s western suburb of Kandivli. Currently, organized retail forms just 3% of India’s retail industry, roughly estimated at $330 billion (approx. Rs13 trillion), but it is set to grow to 16% by 2015, according to estimates by Technopak Advisors, a New Delhi-based retail consulting company. To tap this market, major players such as Future Group, Reliance Industries Ltd, Tata Group, Aditya Birla Group, K Raheja Corp., and Mahindra and Mahindra Ltd have announced mega investments in the sector. The success of these plans, however, depends on the response of the Indian consumer to the organized retail format. Mint, in association with Pitch, a monthly marketing magazine published by Adsert Web Solutions Pvt. Ltd, a Delhi-based media organization, and Synovate India, the market research arm of Aegis Group Plc., conducted a survey to track consumer response to organized retail. The survey findings are based on interviews with 2,787 women shoppers in Mumbai, New Delhi, Hyderabad and Indore over August and September, and indicate the retail brands people like, as well as their shopping preferences. Mint’s survey shows that shoppers are shifting from traditional retail to branded retail outlets because of the variety, and what they perceive as better quality and fresher produce. “Traffic congestion and commuting difficulties that are prevalent in India drive consumers to the best single destination for shopping. This is the single biggest reason for the success of one-stop shops," says Andrew Levermore, chief executive of HyperCity Retail (India) Pvt. Ltd, a hypermarket in Mumbai’s western suburb of Malad. The survey shows that 45% respondents visit branded retail outlets once a month, and one-third of all their shopping happens in organized retail. The signs of growth are visible everywhere. Big Bazaar, the hypermarket chain from India’s largest listed retailer, Pantaloon Retail (India) Ltd, had around 55 stores in June; it’s aiming at around 120 stores by next June. Subhiksha Trading Services Ltd had around 670 stores in March; it expects this figure to cross 1,300 stores by March 2008. Trinethra, which was the most visited in Hyderabad, doesn’t have a presence in any other city. Reliance Fresh is most visited in Indore; it is just in the process of opening in Mumbai. Like others, both Reliance and the Aditya Birla Group, which owns Trinethra, plan a nationwide chain of stores. “The first-mover advantage will not last," says Jayant Kochar, managing director of retail consulting firm Go Fish Retail Solutions. “As more stores open up, business will be driven by the location of the store, if both are similarly managed," he adds. So, chains that manage to bag the best locations while keeping rental costs down could have an advantage. Retailers say they find Mumbai and Delhi the hardest cities in terms of finding space. This may be why organized retail is somewhat restricted in these cities, compared with Hyderabad and Bangalore. That may also be why just 19% of all consumer spends happen in Delhi’s organized retail outlets, compared with 45% in Hyderabad. Despite the limitations, however, the buzz can be felt at organized retail outlets everywhere, with shopping carts virtually locked in traffic jams on weekends. More and more people are hanging out at these stores, where a growing range of products entice—leading to more sales for newer products and categories. 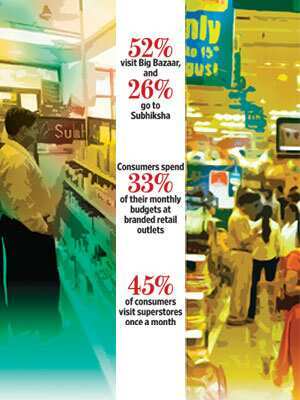 At Big Bazaar, which emerged as the most visited store in the Mint survey, electronics and mobile phone—categories that were introduced only last year—now account for about 6% of sales. At Crossword Bookstores Ltd, the 50-store chain which was the most preferred in its category, sales for non-fiction—traditionally considered a less-read category—rose 30% for the six months ended in September, compared to the previous six months. Goradia visits Inorbit Mall at least every other weekend. He might go to see a movie or hang out with friends—but it often leads to temptation, and shopping. Around Diwali, he bought a washing machine, fridge, grinding machine, food processor, television, water purifier, DVD player and an air conditioner for his new home—all from one shop—in one day. While he had checked out prices at other stores, Goradia bought everything from one store because prices were competitive, and it was convenient. He also bought some things he had not intended to. Consumers may be enjoying the convenience of one-stop shopping and entertainment, but they aren’t yet seeing the retail revolution drive down prices. Most consumers surveyed said they do want to see prices come down in organized retail. In fact, pricing is one area many retailers are concentrating on as the number of retail chains grows. Several are competing to offer the steepest discounts. Vishal Megamart, a unit of Vishal Retail Ltd, offers discounts by stocking more products under its label—these are 30-50% cheaper, according to Vishal’s chief executive Ram Aggarwal. Subhiksha, which is the second most visited store nationally, competes with Big Bazaar by offering branded consumer products and mobiles at lower prices. “Our national footprint is one year old vis-a-vis Big Bazaar, which is five years old. They have two to three times our floor space. But, given the patronage and the USP that we have, it can’t be long before we become the largest—we could be (getting) there even as we speak," says Subhiksha’s managing director, R. Subramanian. The chain opened its first store in Chennai in 1997, expanding to cities across India much later. Go Fish’s Kochar says: “This is the first year of organized food and grocery retailing, nationally. So, while everyone is competing on price now, as the market matures, there will be more platforms to compete on." Some things aren’t clear yet. For instance, shoppers said they would like to see better packaged and better quality products. But retailers seem divided over whether Indians like traditional, open displays of products, or whether they are taking to packaged food. Sales volumes of packaged vegetables and other food have increased by 80% year-on-year at the nearly two-year-old Hypercity. At Big Bazaar, vegetables displayed in open baskets and bins do better than packaged ones. “Indian consumers respond to visual cues, such as touch and feel, to decide what they like and (what they) don’t," says Big Bazaar head Rajan Malhotra. Shoppers are deterred by long billing lines and the lack of parking and shopping space. Goradia says he wishes malls had a centralized database, so consumers could get information on the prices at every store. Ridhi Kasurde, a 29-year-old beautician who lives near the Phoenix Mills mall in Mumbai, says she stopped shopping there because her local shop delivers her monthly groceries at home. “I don’t have to stand in queues for half an hour, and prices may be the same, or cheaper," she says. Despite any reservations they may have, shoppers seem to love the deals and the buzz of organized retail. Mint’s survey indicates that consumers like advertisements which give information about new products and discounts. “From a consumer perspective, advertising on national television does convey reliability and credibility," says Devangshu Dutta, chief executive of Third Eyesight, a New Delhi-based retail consulting company. One indication of how things could play out comes from Hyderabad, home to some of the oldest organized retail stores. Mint’s survey indicates that 53% people go to branded retail outlets once a month in Hyderabad, compared to the national average of 45%. It also shows that 45% of their spending happens in organized retail in Andhra Pradesh’s capital city, compared to 33% nationally. Crossword opened its second bookstore in Hyderabad last year, and sales this November were 20% more than last November, says Aniyan Nair, Crossword’s head of operations and marketing. “It’s not a surprise," says Malhotra. “Consumers there (Hyderabad) are comfortable with retail because organized retail started earlier." Other cities are getting there. “Now, people don’t go to a store with a list and just buy off it," says Third Eyesight’s Dutta. “They don’t go to stores and ask for whatever shirts there are in their sizes to be taken out from closed boxes. Instead, they see everything on a shelf and may end up buying a tie along with the shirt they saw on the shelf." Mint, in association with Pitch, a monthly marketing magazine published by Adsert Web Solutions Pvt. Ltd, a Delhi-based media organization, and Synovate India, the market research arm of Aegis Group Plc., conducted a survey to map the changes in the complex pattern of consumer behaviour in response to organized retail. The idea was not just to measure the number of visits at branded retail outlets, but also to analyse whether consumers were happy with their shopping experience. 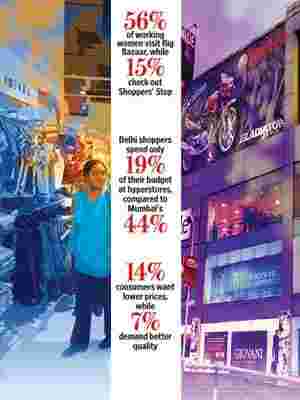 The survey was based on interviews of 2,787 women shoppers outside branded retail stores in Mumbai, New Delhi, Hyderabad and Indore, and indicates which retail brands people like, as well as their shopping preferences. The respondents belonged to the 25-40 age group, and working women were given a 2:1 representation vis-a-vis housewives. A minimum of 20% coverage was given to each of the top three socio-economic classifications (SEC A, B and C). These categories are defined by income levels, as well as the employment of the chief wage earner. To measure satisfaction, consumers were asked to rate the branded retail outlets on a scale of 5-1 on 14 parameters. A weighted average of these ratings was then calculated by assigning weights to these experiential attributes, according to their impact on overall satisfaction. The mean score was then multiplied by the percentage of respondents who have visited the outlet, to negate the effect of number of walk-ins. For stores with a higher number of walk-ins, the extent of penalty on the overall satisfaction index is lower, and vice versa. The satisfaction index thus calculated reflects consumer ratings of a particular outlet, as well as its popularity. For instance, Big Bazaar with 1,441 visits (14%) and a weighted average consumer ratings of 454, scored 6544 on the satisfaction index, compared with the 1680 score of Shoppers’ Stop with 367 visits (3%) and a consumer rating of 458.